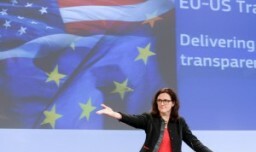 German judges dealt a blow to EU-US free trade agreement talks after declaring a proposed arbitration court illegal. The European Commission last September proposed setting up an investment tribunal court that would allow firms to challenge government decisions as part of its larger Transatlantic Trade and Investment Partnership (TTIP). Critics says the new court, which is intended to replace a much loathed investor-to-state dispute settlement (ISDS) system, will pressure governments into clawing back consumer protection rights and environmental standards in favour of corporate interest. Earlier this week, the German Association of Magistrates, a Berlin-based judicial umbrella organisation, said it “sees neither a legal basis nor a need for such a court”.